Metro by T-Mobile continues to promote its new unlimited plan with a new spot featuring animals. This time, the protagonists are two grizzly bears who talk about the company’s new plans, that include unlimited high-speed data, Amazon Prime for entertainment and Google One for more storage. 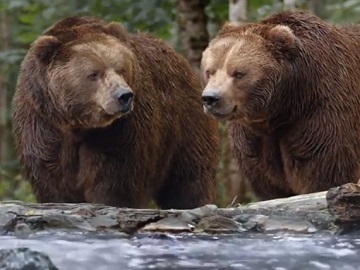 The 30-second spot features the two bears on the bank of a river, looking at other bears as they are struggling to catch some fish. “Hey, did you hear about the new plans from Metro by T-Mobile?” one of them asks him fellow, who says he’s “so hungry.” The first bear goes on to add that these new plans now include Google One and Amazon Prime. “Well, that is new,” the hungry bear answers, still looking around hopeful that some fish might end up in front of him. When his mate tells him he’s thinking about switching, he says “that’s smart”. Finally, when his fellow is sharing his intention of hitting the sushi restaurant nearby, he says he’s in. “Get Amazon Prime and Google One for only $40 per line for three lines, all on the T-Mobile network,” the voiceover says at the end of the commercial, adding the tagline “Metro by T-Mobile – That’s Genius!”. The company also specifies that users at greater than 35 GB/month may notice reduced speeds and that customers may notice reduced speeds vs. T-Mobile customers due to prioritization. The offer is valid for new AmazonPrime members. Amazon Prime has a $12.99/month value. 100GB Google One storage plan included.